The FDIC went ahead and closed another handful of banks this Friday. It really is a rare day to see 400,000+ jobs added and the market retreat so significantly. A large part of the gains came from temporary Census hiring which peaked last month. If the economy were really recovering banks wouldn’t be failing on a continual basis. 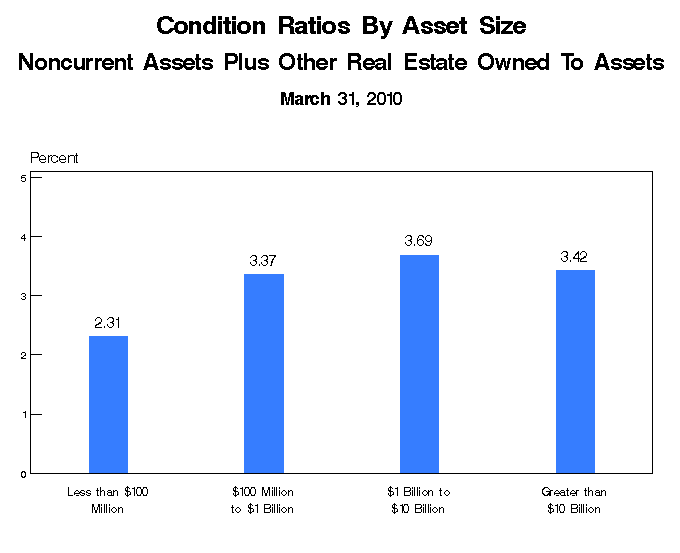 Part of the issue the FDIC has is the concentration of troubled assets in too big to fail banks. 105 banks hold 77 percent of all banking assets. The impression we have is the Federal Reserve and U.S. Treasury will do anything including destroying the U.S. dollar to keep these banks propped up. On the other hand, you have banks that are dealing with massive amounts of bad loans including commercial real estate loans and the FDIC deposit insurance fund is running in the negative. Notice that tiny piece of the pie? Those are the too big to fail. Only 105 institutions but they eat up 77 percent of all the banking assets. The real issue for the FDIC will come from the other institutions on the list that are clearly failing with no preferential treatment from the government. 4,474 banks have between $100 million and $1 billion in assets. Another 2,778 banks have less than $100 million in assets. If these are tiny regional players with large amounts of commercial real estate they will be going bust in the next year or two. 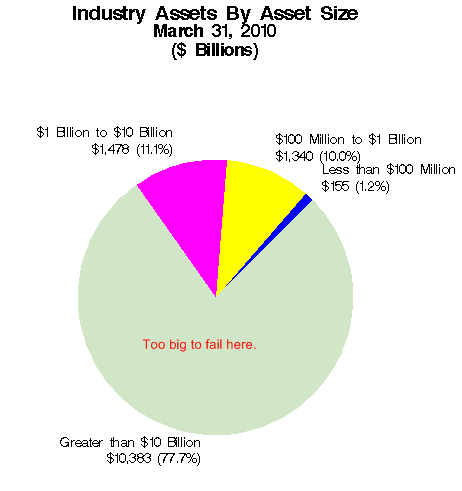 3.42 percent of all assets at too big to fail banks are non-current. How much is this? How can it be that banking problems are still growing while we are in a supposed economic recovery? What should be apparent is that the Federal Reserve and U.S. Treasury are working directly for the profit and success of the too big to fail banks. The banking system has done very little to help the real economy recover and why would they? It is their irresponsible years of lending that led us into this quagmire to begin with so expecting them to carry the flag forward is laughable. The more the government bails out the banking system, the less the above will be worth. Ultimately this is seen through a hidden inflation tax. Currently we are dealing more with a case of deflationary prices in autos, homes, and other financed items. This however is coming more from global problems as other countries with similar problems don’t have the credibility of the U.S. so global markets are rushing to the U.S. dollar and propping it up. But this can only go on for so long. The Federal Reserve and U.S. Treasury are capitalizing on this imbalance for the moment. 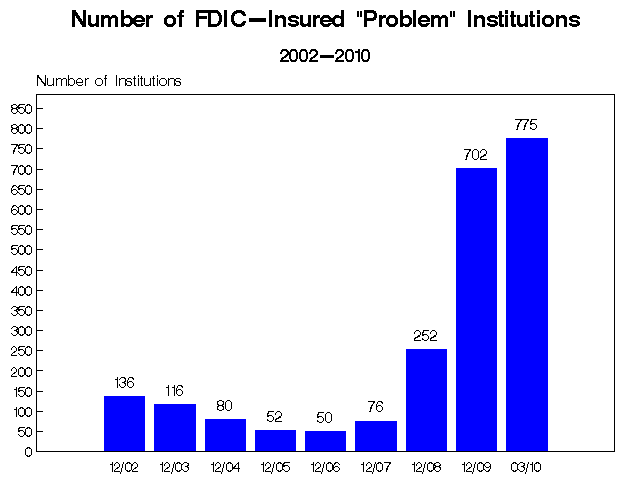 The FDIC is left to deal with the other mess that is at hand with the vast majority of banks in sheer number. The larger banks are now wards of the country even though the people clearly voted against this. Our government for the past decade has not been serving the interest of our people when it comes to protecting the financial system they depend on. Even though the FDIC has an insured maximum limit of $250,000 most Americans are nowhere close to this amount. In fact, one out of three Americans has no savings at all. So this implied guarantee is really geared to the few but what most Americans need today is a stable employment market. Without that, we will see more small bank failures as local businesses are unable to service their loans. With that, the FDIC will be busy.